The step by step accessing Samba share below is done on Windows 2000 Professional. The procedure shown below also can be use on Windows XP or other Windows family operating system. 1. 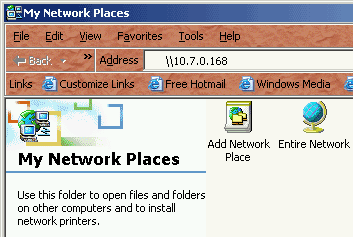 Double click My Network Places icon on your Windows system desktop. 3. On the Enter Network Password dialog box, key in the Windows Username (the Windows Username that you create from 'create samba user procedure') on Connect As: field, then enter the user password in the Password: field and then click OK button to proceed. 3. The screenshot below show the example of the available Samba share folder on Samba Server located at " \\10.7.0.168 ", the example below also show the available printers share and samba home directory for login user. 1. Step by step Samba File Server configuration procedure. 2. The example of smb.conf, the samba sever configuration file that located in /etc/samba/ directory. 3. The example of smbpasswd and smbuser config file located in /etc/samba/ directory. 4. Mount Windows share from Fedora Core Linux. Keywords: using samba share folder, samba share folder, samba home directory, access samba server, accessing samba folder, samba folder, open samba folder, open samba share, samba folder form windows, samba printer share.